Executed in 1985-1990; this work is unique. 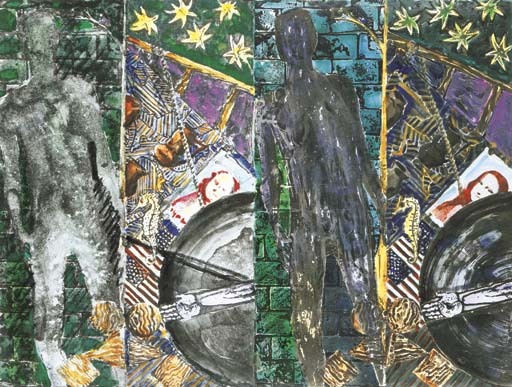 Executed in 1985 Summer is a unique hand painted version of the first of Johns' epic cycle of paintings of the seasons which preoccupied the artist for much of 1985-6 and aimed to represent the changing epochs of his life. Johns began work on the large-scale painting Summer towards the end of 1984 at his new studio in St. Martin and completed it in 1985. "Summer was the first," he explained, and "was actually influenced by this place (St Martin), because when I began the painting I didn't have in mind that I was going to do four paintings. In a certain way Summer is connected to this place in terms of its imagery. It was definitely this house. The hummingbird was in that tree, things of that sort." (cited in Jasper Johns, exh. cat. MoMA, New York, 1996, p. 338). Much of the inspiration behind the iconography of Summer stems from two works by Picasso. The latter's main influence relates to Johns' use of his own shadow falling onto wood or brickwork in each painting and derives from Picasso's 1953 painting entitled The Shadow. The other clear source is Picasso's 1936 painting Minotaur Moving his House - a mythological self-portrait in which Picasso created an autobiographical allegory of an important period of personal transition. Borrowing both the stars and perhaps the wheel of the Minotaur's cart, in Summer Picasso's pregnant horse has been replaced by a seahorse - one of the few male animals capable of bearing offspring. Other powerfully suggestive autobiographical elements also appear in the work including the Stars and Stripes with which Johns made his name and the Mona Lisa - a direct reference to the notion of art as icon as well as to Leonardo da Vinci and Marcel Duchamp.